Color perceptions of the National Temperature | Watts Up With That? 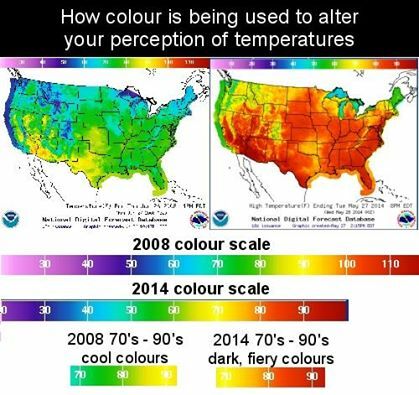 Back in June 2008, I did a post titled Color and Temperature: Perception is everything. One WUWT reader, Jes Simon noticed that since that time, something changed in the way NOAA was presenting the CONUS surface temperature, he worked up this comparison at right, and magnified below. I located the full size graphics as well, and he is correct, there has been a change, but the reason isn’t what he concluded. Here is the original image from 2008, seen at left in the above image. Now some might say that something insidious is going on here, that NOAA has purposely adjusted the color scale, they’d be half right. The reason for this is some small pockets of 110F+ temperatures in the 2008 map, in and near Death Valley, seen magnified below, and with the scale and arrow placed so that it is obvious. So the point here is that just one station, plotting a single pixel of 110F+ temperature is enough to change the entire sliding scale. NOAA isn’t really doing a purposeful adjustment of color here to alter anyone’s perception, it is just the program adjusting the numeric scale based on the range of temperatures within the CONUS. Below is a proposed replacement of the National Weather Service Graphical Forecast Page, a product of the National Digital Forecast Database. Comments are encouraged and can be done by taking our survey. Comments can be left. This might be a good time to suggest a color scale that doesn’t give hot yellows and reds for 70-80F temperatures. 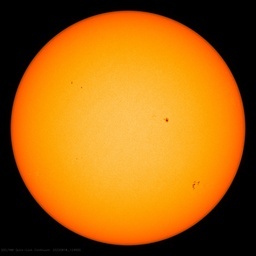 So is one pixel enough to slide NOAA’s magical scale as Anthony claims? Apparently not. 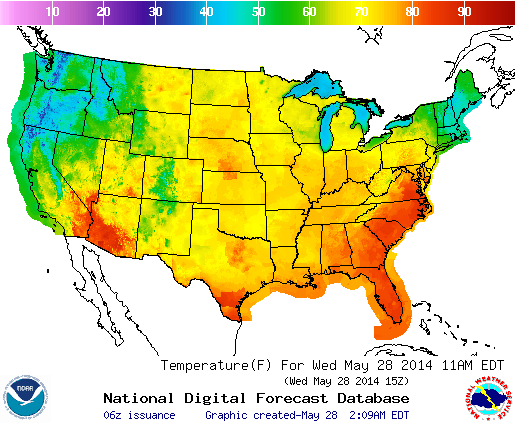 Here is the NOAA high temperature map for May 29th at 8 p.m. EDT. Note the temperature scale goes from 0 to 100 degrees. The coldest point on this map is the Mount Rainer area in Washington State. It is showing a deep blue pixel indicating a temperature in the low 30s. The hottest area on this map is the southwest. It is showing temperatures between Phoenix, Yuma and Indio above 100 degrees. This is not a pixel we’re talking about; it is several thousand square miles of temperatures above 100 degrees. Note the temperature scale does not go above 100 degrees in any of these maps. May 28, 2014 in Temperature. But hot yellows and reds are all the style, doncha know. Actually, it is amazing how warm it makes the map look, and I’m sure they are happy with that. It’ll be something if they pay attention to the suggestions. I just wish the US could drop the F scale and use C like everyone else. That would really twit the tails of the Alarmists, i.e. having the local TV weatherman warn of a 40 degree forecast. The other favorite trick is to not have a neutral tone around zero for anomaly maps. In reality, a (IMHO fairly large) band of anomaly near zero is effectively the same as “no change”. But all the big player’s maps have a bright line at zero, with any positive anomaly shown as the first red shade, and any negative anomaly shown as either a green shade or the first blue shade. 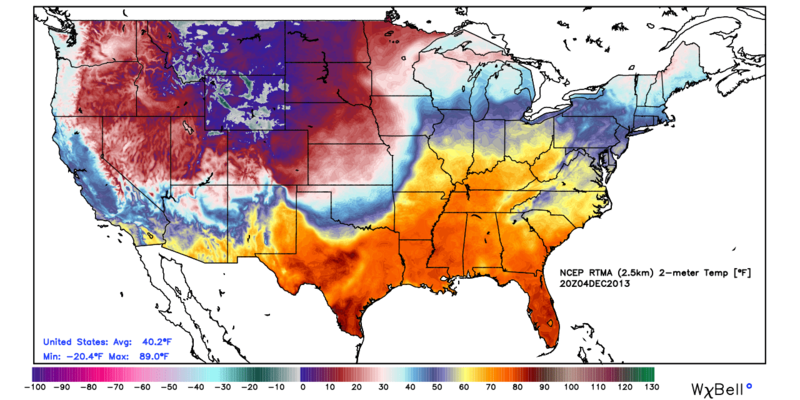 Back on topic, a fixed color scale for absolute temperature maps makes sense too much sense and is too honest, so I’m cynical enough to believe that it won’t be done unless the color mapping is biased so that the “normal” temps make the map look hot. which will see adoption straight after the Turkeys vote for Christmas . It’s no accident that red/bright orange is used , and it is not about the science it is very much about how their colours are perceived by humans. Colour all the scale green. Please, please do not change the Fahrenheit readings to Celsius (centigrade)! The C scale is rougher, with a larger range per degree, thus not as accurate without more decimal places. Not only that, but the F scale has a better rendering of freezing fresh water at rest (32 degrees) and the point where all water is frozen (0 degrees) regardless of motion (I hope my understanding of that range is accurate). F is Fine! C is Curmudgeonly! Keep F! Not to mention showing an ominous deep red for normal human body temperature. Are we all roasting from the inside out ? For colour blind humane see. different colours be difficult to see compre’. Take viridian green as main centre theme. And it is even worse when reds are used to show higher than average temperature anomolies like the pink Antarctic or red siberia. I came across this curious little bit of info years ago, apparently our eyes have 3 colour filters provided by evolution (dogs only have 2), which do not give evenly spaced filtering; they filter colours based on their arbitrary chemical structure, which gives a distinct bias away from yellow, in particular. So what you see in the world is a ‘false’ representation of reality, we don’t see enough yellows, and we see too much red and blue. This may sound trivial, but it has implications, it means that most of art is a superficial construction, it is dependent on the arbitrary filtering in our eyes. (The Mona Lisa would be seen by an alien differently). And the relationship between science and art is also affected, which is partly why science and art are sometimes at odds etc etc. As for maps, the inability of the eye to pick up yellow might also affect them, which is perhaps why yellow is often given a very small range in colour schemes?. This has implications for the maps above. Because yellow is often in the middle of colour schemes, it may also mean that maps tend to one extreme or the other too easily, they tend to polarise cold and hot, which may not be polarised. And the mind? Perhaps something like this is why people tend to become polarised, the’ middle ground’ is easily excluded by the way the mind has evolved. You see the problem, evenness is rare in nature, it may also be the case in the mind and in the eyes. When a lot of colours are used, as in the Weatherbell map, I for one find it difficult to distinguish between some of the colours, especially if they are for a small area. I end up having to look at the regions next to them to work out what part of the scale they are meant to represent. I’ve noticed the issue you mention on some of the ice page maps. All of a sudden, it can look like a large area has warmed when it’s just that the scale has shifted. Good idea and worth commenting, but not a hope. My “climate” prediction is another 10 or 20 degree shift if the scale making it redder. Temps have not been moving 17 years but the marching orders are clear. By whatever means necessary, including outright untruthful statements as seen from Kerry recently and in NCA, the “climate change” is to be presented as “happening now” and ” in a place near you and your family”. This is being pushed at national and state level by all arms of government. This is the year of the big push. UNFCCCP wants all countries to sign a legally binding endebtment of future generations to the tune of $100 BILLION per year EVERY YEAR. And this is the bottom line issue. As it always was in politics FOLLOW THE MONEY. don’t expect more logical cooler colours any time soon. I would ask “Does the software work the same way with the low/minimum temperatures?” before returning the verdict. Quite frankly,as one of the 5 to 8% of males who are color blind, I have no use for charts that use colors to convey information and fail to provide numerical values accompanying the colors. (temperature) there is at various places, the proper method for all concerned would be to use grayscale, where darker means hotter. In this case colors actually confuse the issue rather than clarifies it, as has been noted. In general I recommend NOT using colors to convey information. Amazing that 99% of color blind folks are red-green insensitive, and yet what did those who created stop lights use for colors? Yep, red and green, the dumbest choice available. @John Ware. Water freezes at 32F. The Fahrenheit scale is a centigrade scale. O F was the coldest repeatable temperature Fahrenheit could create. 100F was the temperature of the human body, as he measured it. and 200F was the boiling point of water. The fact that ALL the rest of the world uses Celsius already, and even American science is done in SI units means the days of Fahrenheit are numbered. I don’t think that there’s much of a problem with there being 2 F in every C. If it matters, people can handle a 1/2. Use the drop-down box to change from the National to the Hawaii map. Check out the ocean color. It’s a hideous yellow-orange and they make it more yellow when you switch from maximum temperature to minimum. To my eye the Weatherbell map shows weather. You can clearly see the front pushing down into Texas and the midwest. Which tells you what to expect over the next day or two. The US Weather Service map on the other hand doesn’t show weather. So much of the map ends up being the same color that everything is washed out. You can’t see where the fronts are developing, so you can’t get any idea of what is likely going to happen. There is really nothing unexpected in this. Government agencies are largely ineffective, because they do not have to compete. No matter how poor their products, they cannot go out of business. It isn’t, there is no such thing as a “point where all water is frozen regardless of motion”, it all depends on how much the water moves. Zero on the Fahrenheit scale is quite arbitrary (it was simply the lowest temperature that could be achieved in the laboratory in the early 18th century, by mixing ice and and a saline solution), in contrast to the Celsius scale where 0 and 100 mark the points where water freezes and boils respectively at normal air pressure. As a matter of fact, I find the fact that the F scale has the freezing point at such an arbitrary number as 32 quite annoying since it makes quite difficult to locate on e. g. a map with isopleths. Red is the new green…. Why would you want to use a temperature scale based on French socialism? I mean, if you’re not going to use a 10-day work-week (don’t worry, you still get Primidi & Décadi to drink yourself into oblivion) how dedicated are you to this concept? Anyway, everybody knows that the only real temperature scale is Planck. “NOAA isn’t really doing a purposeful adjustment of color here to alter anyone’s perception, it is just the program adjusting the numeric scale based on the range of temperatures within the CONUS”…This might be believable if computer programs were to write themselves. I can’t imagine the programmer not noticing the effect. Please, please do not change the Fahrenheit readings to Celsius (centigrade)! F is Fine! C is Curmudgeonly! Keep F! Yes, but there are only a couple of Dark Age nations in the world who understand what on earth the F system is all about. Freezing at 34 degrees and boiling at 275 degrees? What is that all about? do not exist and where temps above 85 can’t be distinguished. I can’t accept the reasoning. This does appear to be intentional propaganda. They sure knew how to have proper names in those days. Get a decorator to do this (male or female). Not a scientist. They don’t know color hue and scale from squat! I have been experimenting with warm vs cool colors since the late 60s. Unless I misread this, the author of this post misses an opportunity. I suggest taking the exact same data (either 2008 or 2014 or both) and apply BOTH of the color scales side by side. Taking a 2014 image with a “similar” distribution of temperature doesn’t have the same impact. Showing the change when applying the different scales to the SAME data would have been much more effective (albeit more work). I can see no expansion or compression in the new scale as NWS fits the same temperature range (80°F, but 10-90°F instead of 30-110°F) into the same color gradation. So there is a shift down. NOAA isn’t really doing a purposeful adjustment of color here to alter anyone’s perception, it is just the program adjusting the numeric scale based on the range of temperatures within the CONUS. You left out the /sarc tag. If it were simply a case of the numeric scale adjusting to the high temperature entered, then the low ends on the 2008 and 2014 scales would match. But the high and low ends are equally shifted downwards by 20 degrees in 2014. That leads me to believe it really is a purposeful adjustment of the color scale. The NWS Customer Service Survey does not accept my response (“You have not filled in the required fields ! Sorry !”) although all entries are complete. Perhaps my response would be accepted if I submitted a higher approval rating and deleted my suggestions for improvement? The color scale, whatever the colors are, should be chosen so that it would be understandable if printed in grayscale. Select Alaska – 60F is red! I wonder what happens in Winter? Also, there is an option to select C or F (English or Metric). Click the menu button on the upper right. I recommend a color scale based on how much money it costs to stay comfortable. If you can leave your windows open it’s green. The more you have to crank up the heat, the more blue. The more A/C you need the more red. “man bites dog” gets our attention while “dog bites man” does not. Also why you don’t feel that shirt you are wearing: you’ve tuned it out. It is a very interesting point you bring up, though: if exception reporting is a drive across all of our emotional, intellectual, spiritual and physical lives, we will find problems, i.e. divergences from the “normal” whatever we do, wherever we look. Another, primal, reason to be a skeptic: we are genetically predisposed for disagreement with what we experience as it appears to diverge from the central “norm”. srvdisciple: hawaii would be perpetually green, but it sure costs a lot to live there even though there is little need for heat or AC. I too prefer Fahrenheit for weather. It uses the full range of double digits. Celsius doesn’t, as temperatures never get above 65 C, and rarely above 50 C. In Fahrenheit, temperature are usually in the 0-100 range while temperatures above 100 are simply too d****d hot, and below 0 too d****d cold. Celsius makes more sense for cooking. For science Kelvin is king. Please, please do not change the Fahrenheit readings to Celsius (centigrade)! Yup, use the Rankine scale instead. I reckon 528 degrees for a pleasant spring afternoon is sufficiently scary. Managers at pay grades higher than the programmer instituted this change. C’mon guys, they didn’t deliberately create a system that when given a mild year with virtually no extremes it would paint the whole country bright red. It was an accident. If that one pixel was enough to slide the scale up then the same should hold true for today’s temperatures correct? 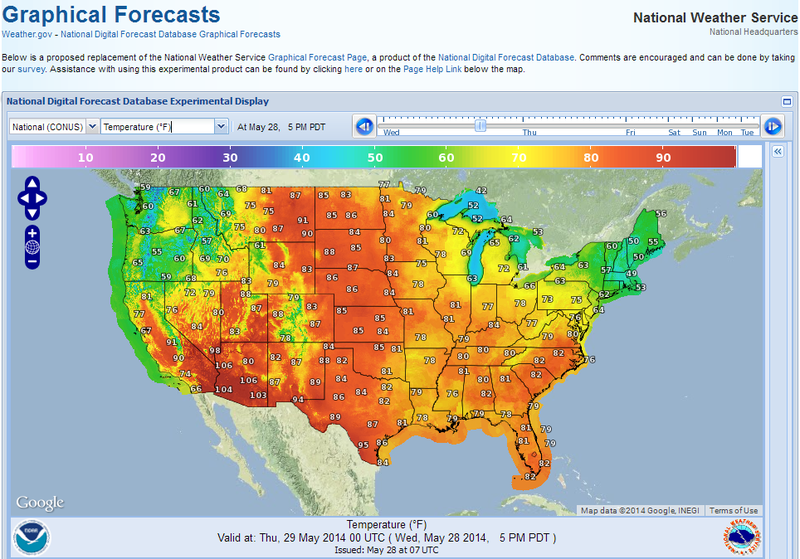 If you look at http://graphical.weather.gov/ for the May 28th, 5 p.m. map you’ll see it max out at 100. Yet if you zoom in on Phoenix and Tucson you see temperatures well into the 100’s (104 and 103). Today’s map is an example of a redder (hotter) U.S. map because they threw out anything over 100. For a computer program to adjust its scale to the range is absolutely standard. Not doing so would cause massive amounts of work everywhere that graphs are used. If a fixed scale was used for the weather map, then in a warming period the entire map would shift towards red, so the automatic scaling actually operates against the propagandists. We are used to 3d contour images for height http://www.scisoft-gms.com/wms_details/DEM_Module.jpg why not use heat to form a 3d contour heat range map, ignoring height ?. That would help those who are colour blind as well. For them to be honest every previous map should be revised to reflect the new range and scale. The alternative us for every new range/scale to come with a large font disclaimer. Interactive map: Which countries have emitted the most carbon since 1850? Alaska??? I don’t think so!! then the color of the map could be used to judge human comfort. having a sliding scale is nonsense. you could end up in the middle of winter with freezing temperatures appearing comfortable. meanwhile there is a REAL science debate in climate science. the real debate is over how much warming and what we should do. wasting time and effort and energy on chartsmanship is silly. I noticed them using this technique on the weather channel as well. That depends on the goal doesn’t it? Is the “chartmanship” to accurately portray the temperatures or to just give an impression of temperatures that supports “the cause”? There’s been a PR campaign in progress at least since Hansen and Wirth turned off the cooling. Gotta keep the gravy train on the path to power. I haven’t seen The Weather Channel mention the record highs and lows on the local weather on the 8’s since last November. It’s hard to imply that the weather is unusual when it’s happened before. There is not even a shadow of doubt in my mind that the new color scale is designed to specifically make the country look hot, hot, hot in full propaganda-like furthering of the global warming agenda which has fully adopted and is being actively promoted by all Agencies of the United States Government. Will it ever end? I doubt but fervently hope so. “meanwhile there is a REAL science debate in climate science. “What we should do” has no place in science, period. You must be a True (REAL) Scotsman. A “debate” indicates a lack of consensus, and of whether warming is or will occur. If warming is real, & is caused by carbon dioxide, then why are people like you who claim to believe it still using electricity? If you don’t believe that your electricity use is causing global warming then you are simply lying to us. Kindly do what Malthus, Ehrlich, & a host of other doomsayers would reasonably demand of you. Sorry didn’t mean to post that so quick. We are all human, lets use a human scale, lets not be dictated to be how water behaves. It’s just so easy to fix color scales with computes these days… in Matlab it would be caxis([-50 110]) to clip the scales between -50F and 110F… however, this would make temperatures on a nice 70F day show up as a reddish-orange. It’s a hard problem, actually, to pick an HSV color scheme (or ROYGBIV) and a linear scale that covers all the range of possible US temperatures and keep 70F from being orangish-red. Maybe better to clip from 30F to 110F which puts 70F as a nice green comfortable color. “what we should do” is a policy question. it is an economic question and engineering question, outside the scope and competency of climate science. long before there were climate models their were economic models. Economics developed the mathematics to evaluate models and their predictions. This allows faulty economic models to be recognized and eliminated. climate science on the other hand has no method to eliminate faulty models. Thus the IPCC includes all climate models in its projections, and we end up with the current scenario where virtually all the models are running hot. Statistically this should be impossible if the models were truly modelling reality. 1/3 of the models should be hot, 1/3 should be cold, and 1/3 should be about right. But we see nothing like this because climate science has not applied the lessons learned in economics to eliminate faulty models. Once the models have been cleaned up, and we can place some trust in what they are telling us, only then are we ready to evaluate the costs of “what we should do”. This is where the engineers step in. They are the ones that can tell you “what we should do”, because they are the ones that actually have experience in doing something. Neither climate scientists nor economists should be telling us “what we should do” because they have no experience in actually doing something. They are in large part ivory tower egg-heads about as divorced from reality as anyone can get. The reality is that no one dares ask engineers what should be done to solve climate problems, because the answer is so obvious. Image you get 100 engineers together and tell them that increased CO2 will lead to warming temperatures will lead to rising sea levels. Can you for one instant believe the engineers will say “we better get all the worlds leaders together so they can all agree to stop producing CO2”? Can you for one instant believe the engineers will say “we better slap a tax on CO2, so that everyone will stop producing CO2”? Can you for one instant believe the engineers will say “we better cap and trade CO2, so that everyone will ship CO2 production from their countries to other countries”? Of course not. The engineers will say “we better not build new buildings in low lying areas. Since buildings need to be replaced every 50-100 years, by the time sea levels rise all the current low lying buildings will need replacement anyways, so they can just be abandoned to the sea.” Problem solved. Long before we had engineers, we had farmers. Farmers knew better than to build on low lying areas. That was where you planted the crops, after the flood waters receded. The new soil from the flooding is what made the land fertile. Instead, farmers built their houses on the hill-sides overlooking their fields. Then along comes generation after generation of city dwellers. No experience living with nature, they start building in the low lying areas where land is plentiful and construction costs are low because the land is level. It costs a lot more to build on the hill-side. And then when it floods and their houses are lost to nature, what used to be called an “act of nature” is suddenly “climate change”. Ignorance by any other name still smells of ignorance. As a retired NWS forecaster, what is going on here is that the scale is seasonally adjusted, always showing 100 degrees of spread across the color spectrum. The 2008 map is from the end of June, while the 2014 map is from the end of May. They (those who program these changes) will probably switch over to the summer scale sometime in the first half of June. If you really want to see some screwy colors, check out the sky cover and POP maps, we complained about the lack of definition in those from the very start back in 2003, but nobody listened to us.